Stagnation is a common problem faced by Solar Panels in Ireland. Often, stagnation is a symptom of poor system design, or cost-cutting by an installer. Stagnation occurs when the solar cylinder is up to its set temperature, but heat is still being collected in the solar panels. This can happen on especially sunny days, or on days when the homeowner is away on holiday and there has been no hot water drawn off from the cylinder. Once the solar cylinder is up to working temperature, the solar pump shuts down and circulation within the system is prevented. As the solar panel is still producing heat and cannot be shut off, it will heat up to the point where the solar fluid will begin to boil. 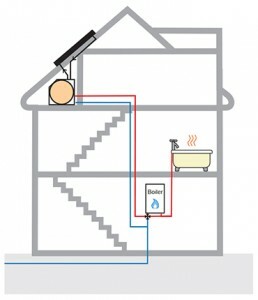 Depending on the set pressure, most pressurised solar thermal systems will begin to boil at 130°C. Steam temperatures of 180°C or more in a stagnating vacuum tube solar panel are not unheard of. Effects of Stagnation on Solar Panels. First and foremost, extreme temperatures accelerate wear and tear on the system. While most solar panels are rated for stagnation on paper, continuous extreme-temperature heating and cooling will stress fittings and accelerate the breakdown of any sealants. Boiling solar fluid can damage system components if it is allowed to move from the collector down to the pumpstation or tank. We’ve seen cases of pumpstation impellers being outright melted by overheated solar fluid, and expansion vessel membranes being ruptured. When the fluid in the panel boils to steam, it expands massively, causing a pressure spike inside the sealed solar system which further stresses overheated fittings. Pressure can get high enough to open the system’s pressure relief valve, dumping solar fluid into a catch tank, and causing a loss of system pressure when the solar panel cools and boiled fluid condenses. The loss of pressure only accelerates the boiling process and makes the system more likely to blow-off in the future. Stagnation also has the effect of accelerating the decay of solar antifreeze. Boiled propylene glycol antifreeze not only loses its effectiveness rapidly, it begins to turn acidic. Acidic antifreeze will attack system components accelerating corrosion and reducing the lifespan of your solar system. Furthermore, antifreeze that has lost its effectiveness may allow the system to freeze solid in winter, bursting pipes and fittings, leading to an expensive suprise when everything melts again. 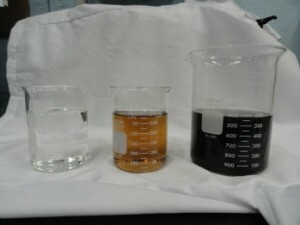 Clear Fresh Glycol, Aged Glycol, and burnt Glycol degraded by Stagnation. How do I prevent Stagnation on my solar panels? There are techniques to mitigate stagnation. Some installers will undersize a system slightly, fitting a smaller solar panel or larger solar cyclinder. This ensures that the system will only stagnate in unusual circumstances. The downside of this, is that the system will require supplimentary heating more often, which has the effect of increasing your energy bills. An alternative is to fit a heat dump to the system. A heat-dump is a secondary radiator sized to match the solar panel’s rated heat output, with a diverter valve that switches flow to the radiator automatically when the cylinder is up to temperature. It’s a good solution, but it’s also an expensive one. A heat-dump fitted to a solar system can represent an additional cost of €400-€500 on an installation. For this reason, most installers outright ignore stagnation as a problem. 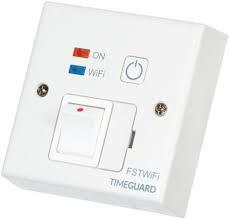 By the time it begins to affect the homeowner, the system has left its statutory warranty. A solar thermal system will be a part of your home for decades to come. The bottom line is, excessive stagnation will cost you money. Either on installation, or several years down the line due to accelerated wear and tear. Drain back Solar Panels offer a much better solution. Greentherm are the national agents in Ireland for the full Viridian Clearline range of flat panel drain back solar panels. 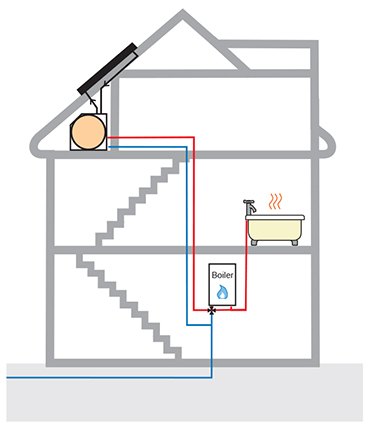 With a Drain back solar thermal system, fluid is only present in the collector when the circulating pump is active. At all other times, fluid is allowed to flow back to a storage vessel under gravity flow, leaving the panel dry. Therefore, there is no fluid left in the panel to boil and turn to steam. Because of this a drainback solar system does not require a heat-dump or an expansion vessel. Because the panels remain entirely dry when the system is shut down, it is safe to leave them idle over the summer. Furthermore, in Winter, because the panels remain dry, the risk of freezing is minimised. Antifreeze isn’t even required. Clearly then, Drain back solar thermal represents the ultimate solution to stagnation questions. It’s more cost-effective to install than a heat-dump system. The system is longer lived, and more robust, and can be sized to give a higher output. Contact us now, for sales inquiries, or more information on Drainback Solar Panels. One of the costliest and most time-consuming jobs in any solar thermal retrofit, is fitting a new solar cylinder. The old cylinder must first be removed and disposed of, with central heating and hot-water systems being disconnected, before a new cylinder is fitted, then plumbed into place. Not to mention the lost space in the Hot Press which is consumed by a large hot water tank. 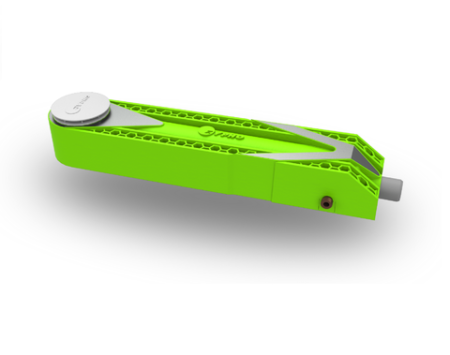 The Viridian Pod is a game-changing new approach that simplifies installation work, saving you time and effort. And saving the Hot Press. Compatible with both Drainback and Pressurised Solar Panels. 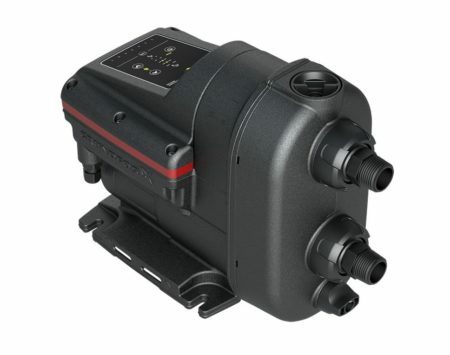 Pump station and controller integrated into one package. No unnecessary wiring. No time consuming plumbing work. It just Works. Horizontal design. Can be fitted into any attic or crawlspace. Can be located directly beneath the panels for maximum installation convenience. Fewer connections required. Robustness built in. No need to disassemble and rebuild the existing plumbing system to fit a new solar cylinder. Reduced potential for leaks requiring repairs and costly call backs, saving time. Compatible with any heating system. 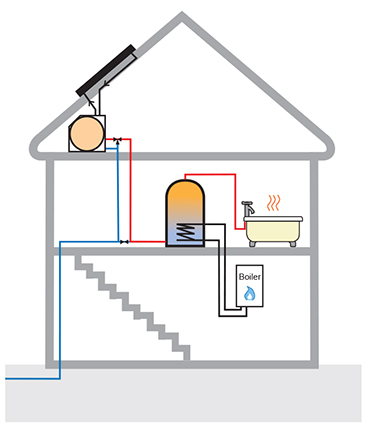 Preheated water can be supplied either to an existing domestic hot water cylinder or to a combi-boiler, simplifying system design. Custom designed systems are not required. Greentherm Recommends Viridian Clearline Solar Panels. Greentherm recommends matching Viridian Clearline Solar Panels with your Pod, for maximum compatibility and ease of installation. Call now, at 01 5314781 to avail of introductory pricing on full system kits, and individual Pod systems. The Viridian Pod saves you Time. Time on maintenance and repair. Contact us now for sales and technical inquiries.